I spent the past week watching Netflix’s Queer Eye reboot and trying not to think about the Supreme Court. It worked; it’s seductive to watch five photogenic gay men teaching slouchy, sometimes-homophobic people to change their lives, leaving them with an Instagrammable wardrobe, home, and haircut, and an abundance of mutual love. The show is, as Helen Rosner recently said, “engineered in a lab to make you cry hysterically,” and also to make you laugh — particularly through its sweetest and hammiest host, the “grooming expert” Jonathan Van Ness. Van Ness disarms even the most closed-off participants with his relentless humor and goodwill, so when I finished the season, I turned to his personal podcast Getting Curious With Jonathan Van Ness in search of more feel-good escapism. I found something else entirely. 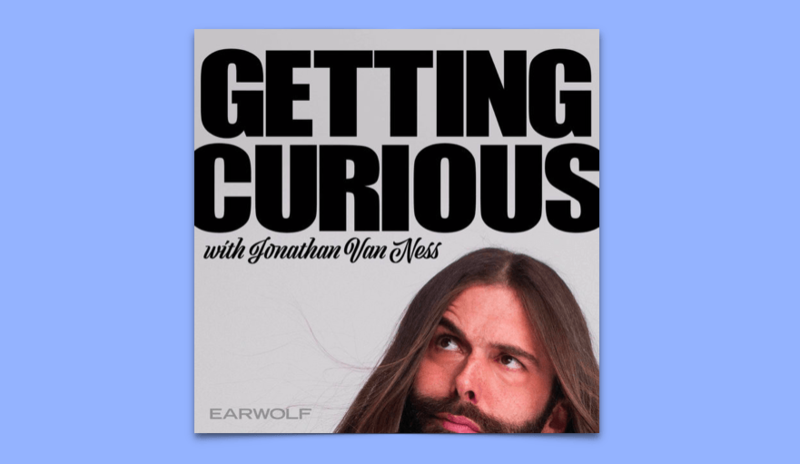 On each episode of Getting Curious, Van Ness brings on a guest—typically an expert on a topic about which he is curious—and interviews them for a meandering, buoyant forty-ish minutes. The show’s sixty-plus episodes (he has hosted it since 2015) encompass a variety of issues: women in the military, the plight of bees, gravitational waves, the opioid crisis, LGBTQ mental health, geopolitics, figure skating, and cults. His demeanor is the same as on Queer Eye (he calls everyone “honey” and exclaims rather than speaks), and while the TV show portrays him as frivolous but lovable—all heart and little brain—it’s clear from his podcast that he’s deceptively well-informed. As you might have guessed, Van Ness is not a Charlie Rose or a Terry Gross—neither sober nor well-spoken, he is a chaotic blend of charisma, bad interviewing practices, and a genuine curiosity that can’t help but draw insight and vulnerability from his guests. He is unabashed and unpretentious, with the humility to ask basic questions and the attention and intelligence to follow up with complex ones. This makes him a good proxy for listeners, who are bound—due to the breadth of his interests—to know very little about the majority of topics at hand. Beyond this, Van Ness’s curiosity is infectious. I listened to the episode “How Can We Be Less Rude To Bees?” to see if the show could transfigure what struck me as Van Ness’s dullest interest. It did; I was fascinated to learn the process by which hives choose their queen, and I’m grateful to know why (and how) humans should be polite to the bees that propel our ecosystems. At the end of the episode, Van Ness breathlessly invites his entomologist guest to return to the studio to narrate a day in the life of a honeybee. He got me—if that episode airs, I’ll listen. But Van Ness isn’t always a patient or perceptive interviewer. He’ll often interrupt a guest, either out of excitement or to steer the conversation back towards his own curiosity (which does not always align with the guest’s or the listener’s). Sometimes his interjections are germane, but I’m frustrated when he redirects a guest before they can answer the question he has asked, let alone pause to formulate a more complex response. Van Ness is allergic to conversational lulls, and while silence over dinner might be awkward, it’s essential in an interview: oftentimes, insight comes only when a guest’s practiced words begin to fail. Worse, Van Ness’s interruptions are sometimes incorrect. In his interview with Queer Eye culture expert Karamo Brown, for instance, he cuts off Brown’s plea for gun control to make a point about the Second Amendment—a digression that is both verbally and historically incoherent. This harms the show’s credibility, and a less generous guest than Brown would be rightfully furious to have his informed political stance undercut by his host’s sloppy rhetoric. Van Ness’s idiosyncratic hosting means that Getting Curious is at its best in more personal discussions, ones in which he is curious about a guest’s life rather than simply their profession. His interviews with Olympic figure skater Mirai Nagasu, undocumented UCLA student Erick Zerecero, and army veteran Linsay Rousseau Burnett are charming and insightful, as their bubbly rapport allows Van Ness to ask sensitive questions without seeming intrusive. The headier episodes—“Who Was the Beyoncé of Renaissance Art?” or “How to Apply Ethics to Everyday Life?”—are equally engaging, but Van Ness does not ask the foundational questions that would allow audiences to grasp the basics of an esoteric field. Instead, these episodes thrive on piquant anecdotes (the sexual tendencies of High Renaissance painters) and meaty tangents (the relevance of German ethicist Dietrich Bonhoeffer to Trump’s America), but ultimately leave listeners without much context or applicable knowledge. Regardless of its weaknesses, Getting Curious is important for both its informative content and its implicit ethics. While my own mind is a menagerie of idle curiosities that I’ve mostly failed to address, Van Ness sees curiosity as a civic responsibility, a means of filling gaps in his knowledge and experience that prevent him from caring for others. No topic—no matter how fraught or complex—intimidates him into ignorance (What do I do if my friend is at risk of suicide? What don’t I understand about racism?). This makes difficult subjects approachable and evangelizes the value of open dialogue, both of which are politically urgent in this divisive and precarious time. In light of this, I’m embarrassed that I came to Getting Curious in search of the Jonathan Van Ness of Queer Eye—a man who is quick to hug, lighthearted, and witty—believing that he would distract me from my political despair. The Jonathan Van Ness of Getting Curious wouldn’t look away from the rebalancing of the Supreme Court or the fraying of NATO—he would discuss them, at length, on air.